No plan withstands first contact with the enemy, well no wargames plan withstands first contact with the cold virus. The planned ACW Volley and Bayonet game with Keith had to be postponed because of one of those nasty viruses, so Adrian and I adjourned to the dining room table for some early Napoleonic fun. 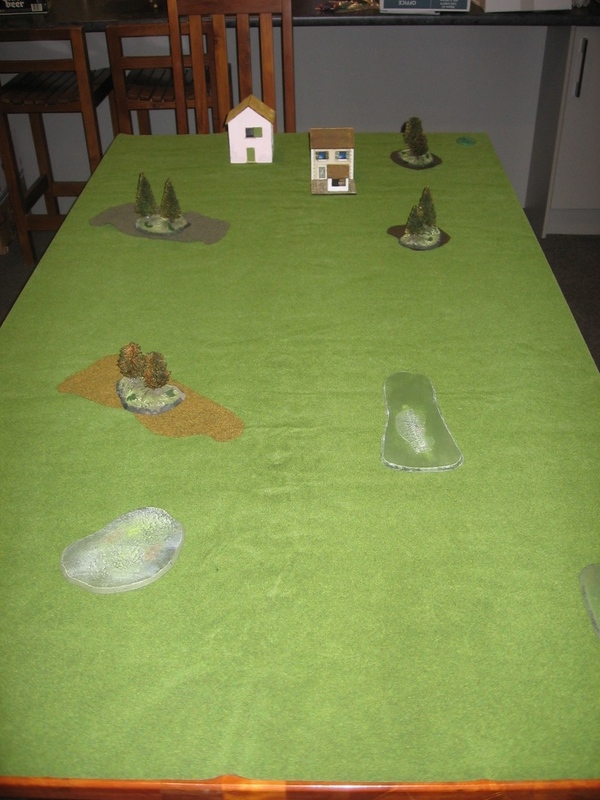 Adrian had taken a late 18th Century Austrian vs French battle and scaled things down a little to give us a game playable on a 6' x 4' surface. 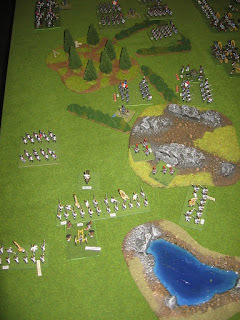 The French were in defence, with the Austrians attacking. However historically the Austrian plan wasn't well coordinated so their forces arrived piecemeal, replicated with a die roll for arrival on the table. However, when 'tin bum Sutton' has his day (which happens VERY rarely), he really has his day, and the entire Austrian army arrived within the first three turns of the game. Initial deployment seen from behind the Austrian position, with the first two divisions (infantry, and cavalry) having entered the table. The overall plan was for the Austrian right to simply engage and hold, while the centre and left coordinated an attack. Austrian dragoons entered the battlefield on the Austrian left wing to threaten the French right. The Austrian right wing had held but was exhausted and reduced to two regiments. The game ended with Adrian poised to try to sweep around the Austrian right. However both armies were teetering on the brink of complete exhaustion. This was a finely balanced game. Had the Austrian arrival been more staggered (as historically it was) then the French would have been in a better position to go over to the attack, as they did historically. Nonetheless an excellent outing on the table with some beautifully painted 15mm miniatures. When Andy arrived for last night's game he presented me with this supermarket bag. "These are for you". Really? You're joking. Nope... they had been given to him by a friend many years ago, and had lain unused in Andy's garage, possibly for a couple of decades. He thought they might be useful for the developing German force. First there were these bags. These packets are apparently from a Chinese company: two Flak 88s ( I have none at the moment), an Sdkfz 7, and a couple of packs with Kubelwagon and motorcycle/sidecar combination. And then there were the boxes. A box each of Revell German WW1 infantry (superb figures) and Revell German paratroopers. The remnants of a box of Italeri German Infatry, and.. dah dahh... a Hasegawa Sdkfz 251/9 Stummel, an Esci Sdkfz 250/9 and an Sdkfz 250/3 Grief. These will see good service in the 20mm Spearhead armies. Or, I may simply enjoy making and painting the kits and figures (mind you I am well and truly over the old school kits that present you with individual track links to glue on for the tracks - but never look a gift horse in the mouth as they say). What an awesome score... the generosity of friends, eh!!! Finally .. finally, I say.. I managed to get Andy around for a game. We'd been exchanging texts for weeks about Kings of War V2, so we thought we'd play a game. We managed to convince Adrian to join us for some fun, Dwarves vs Kingdoms of Men. The eerily silent battlefield, who would have thought such carnage would be wrought on these fine green fields? Andy deployed with Knights on each flank, and archers and foot guard holding his centre. The Dwarves deployed with their fire power concentrated in their centre, the flanks held by Ironclad regiments supported by a steel behemoth and some Brockriders. I love the Dwarf gyrocopter, and use this as my steel behemoth in the absence of a proper steam tank. Andy had place a regiment of knights on his right flank, and these swept around and attacked the Brockriders. In hindsight this was never going to end well for the Brockriders. The left flank Ironclad took casualties from a regiment of human archers which boldly advanced towards them. The Dwarf King threw himself forward facing off against the rampaging knights. This was the hero's finest hour. The Ironclad regiment was caught in a classic fork, archers to their front, knights to their flank. They destroyed the archers but were caught in the flank by a full regiment of knights. However the Dwarf gun line had managed to turn itself, and brought its entire might down on the knight regiment. The field was littered with the bodies of humans and dwarves. The Dwarf gun line, supported by the great steel behemoth was all that remained of the Dwarf army, but the only signs of human life came from the Human 'Captain' and his Battle Standard Bearer fleeing to avoid capture. The game had played out well. The 2nd edition of Kings of war shows signs of refinement over the 1st edition, and plays even better than the 1st, evidence of a company that listens to player feedback and focusses on giving 'gamers a good experience. We had a great evening with plenty of laughs, lots of cinematic 'gaming moments, all accompanied by beer and sausage rolls. Doesn't get much better!! !